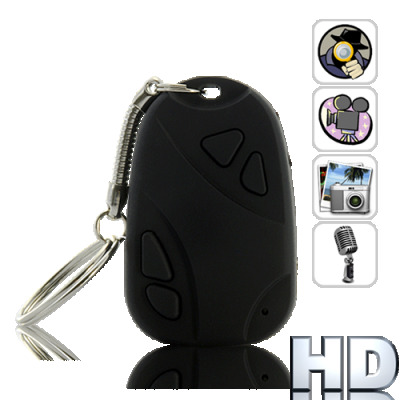 Successfully Added HD Camera - Keychain Car Remote Style (4GB) to your Shopping Cart. HD Camera - Keychain Car Remote Style (4GB) - The perfect way for aspiring secret agents to capture all the action in high quality video, and without arousing suspicion. Coming in a compact form factor and presented in raven black, this discrete camera is disguised as a standard car alarm remote on a keychain. This compact and pocket-sized device has been designed with maximum portability in mind so it fits unobtrusively anywhere. Most importantly, with both audio and video capturing ability and a pocket size, this is a perfect device to recording hours of business meetings or interesting events on the sly. Stay one step ahead with this incredibly fun, discrete and unique video camera. With the convenient one button operation you can easily capture video on a moment’s notice, anytime anywhere. Additionally, with high resolution still photos (3264x2448), smooth 30 frames per second AVI videos at 720P high definition resolution, this device can also be used as a standard Mini DV recorder, webcam, and still-camera for candid shots, but in a highly convenient keychain form factor. What’s more, coming with a free 4GB SD card, you can be confident of never missing any important scenes. Place it on your desk, on a shelf, in the background close by, or attach it your keychain. It is the perfect covert device and candid audio video recorder for beginners and professionals alike. This cool product is now available in stock at an amazing wholesale price. Order a sample today and it ships within one day. Brought to you by your source for China factory direct electronics – Chinavasion.